While putting together this edition of the Unique Property Bulletin we were struck with how many buildings listed have now been sold. The big question of course is how solid can this recovery be? Hopefully gentle and durable. There is a discernible revival in the UK property market at the current time. Though the evidence we see is that the recovery is centred in London. Often with London property that is unusual enough to feature and which we find on a Monday – it ends up being marked as “sold” when the Unique Property Bulletin is ready for upload and going live at the following 9pm Sunday night. Just out of curiosity we started to mine the resource of several hundred unusual properties within this website to see how many were still for sale, and which ones have sold. Then an odd thing hit home. Just now, right now, it appears a good time to buy outwith the London area. There are several properties that are still available, and have been for sale for a reasonable period that then inclines the owners to reduce the price. Time to buy a bargain? The best of both worlds perhaps? A New Year Sale [apologies at the lateness of this New Year Sale – unavoidably engaged offsite]. We do have property owners taking substantial amounts off of their headline prices. Alongside what appears [though not guaranteed] to be a rising property market, with the price increase ripples just starting to spread beyond the London M25 Orbital Road. So this week, just for fun, we are reviewing what unique properties are floating around and have had significant price reductions. Our version of a New Year Sale. Hopefully it will be illuminating and enjoyable. Was £2,300,000 – NOW £1,990,000. Kemey’s Folly is a Grade II Listed former hunting lodge with origins dating back to circa 1712. The Folly was rebuilt in the early 20th Century and converted into a residential dwelling for TE Watson, the High Sheriff of Monmouthshire and has been the home of the present owners for several years. Kemeys has an almost 360° view, taking in many historic landmarks. Featured on Channel 4’s Grand Designs programme and considered an architectural success, the property combines both historic and functional contemporary living. Designed by award winning architects Davis Sutton, the property incorporates a beautifully appointed and highly specified interior and is situated on an elevated and level ridge with breathtaking 360° views taking in nine counties. Enjoying an east-west orientation, the outlook includes the Severn Estuary and North Somerset to the front, with the Usk Valley and the Brecon Beacons to the rear. The 24 acres that come with this fine building consist mainly of historic woodland and pastures, including equestrian facilities as well as formal gardens and terraces. The swimming pool complex requires some attention, but would add further value. The current arrangement features three high quality bedrooms within the main body of the Folly, including a master suite with dressing room, en-suite and large sun terrace offering an outstanding vista. The two remaining bedrooms also both have en suite facilities. The principal living areas and remaining bedrooms are contained within the ground floor of the Folly and the newly constructed wings. These elements include underfloor heating with Pilkington K Glass windows and a high quality cinema room and audio/video entertainment system that is available throughout the whole house, including the historic Folly. Location: Kemey’s Folly, Coed Y Caerau Lane, Kemeys Inferior, Newport, NP18 1JR. Guide: Was £2,300,000 – NOW £1,990,000. Contact Savills Tel: 0117 933 5800 – Richard Brooks or 02920 368930 – Peter Reilly. Was £2,500,000 – NOW £1,500,000. In old merchant navy circles, to invite a fellow Royal Navy or Merchant Marine sailor for another drink is often met with two words “sail again”. Here we have a similar theme. 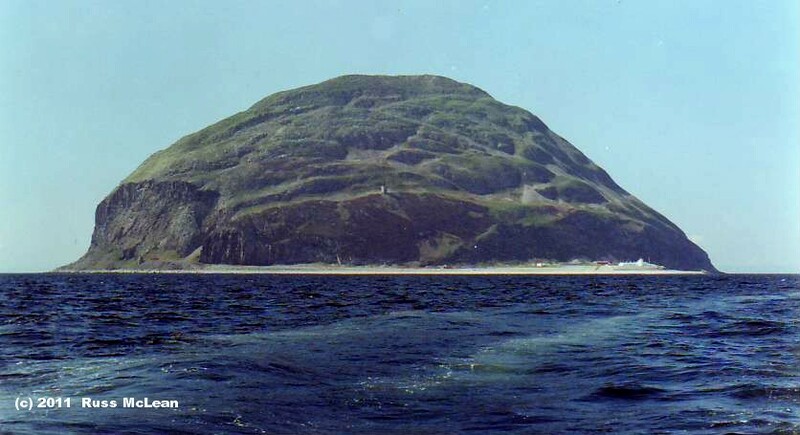 An iconic island that many seafarers know of – Ailsa Craig. Last year it was placed for sale at £2,500,000. Unfortunately, no one purchased this gem at that time, and after a couple of months, the owners took it off of the market. For the 2014 Unique Property Bulletin January Sales we can advise that a cool £1,000,000 has been shaved off of the original asking price. Here at Unique Property Bulletin we are delighted to feature this island, the small portion of habitable parts we were privileged to have custodianship of from 1999/2000. These were the Lighthouse Keepers’ Dwellings, Winch House, Railway and Pier etc. These parts are NOT included in the current £1,500,000 price tag, but we understand they are available for purchase by separate negotiation from the chap we sold them to a few years ago. What is for sale just now is the main island of Ailsa Craig as more fully described on the weblink to Knight Frank Agencies at the foot of this special advertisement feature page. 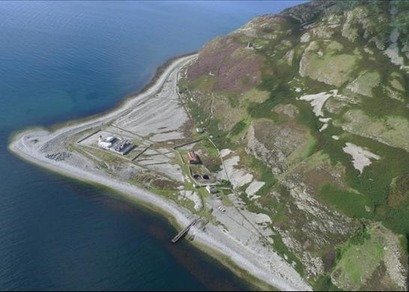 Ailsa Craig Island – Lighthouse Complex, Winch House, Railway & Pier (c) 2014 Knight Frank. As far as the old “sail again” phrase goes, we have here a new variation on the nautical theme – this time “sale again”. The island has been placed back up for sale, now with a cool million pounds snipped off of the price. The current guide price for this wondrous piece of rock is a veritable bargain at £1,500,000. Anyone wishing to have questions answered are directed towards Ran Morgan at Knight Frank property consultants on UK 0131 222 9600. For our part, as former owners of a significant lump of this rock, we are keen to help any reader of the Unique Property Bulletin should they wish to look at buying the island. All you need to do is send us your questions via this email link and we shall do our best to answer. Ailsa Craig Island Lighthouse Complex (c) 2014 Russ McLean. Agency Description: An iconic island lying in the outer Firth of Clyde, 10 miles off the shore. Home to the world’s best known Curling Stone Quarry. Annual rental income of £26,000. One attractive cottage and various old buildings included. In all about 219.69 acres. The vast bulk of the main island is for sale at a guide of £2,500,000. It is worth checking out our Unique Property Manual to see how the negotiations for neighbouring Sanda Island went. Maybe save a few thousand pounds on a purchase of Ailsa Craig Island ! Especially as the £1,000,000 mentioned above has already been saved from last year’s guide price. With regard to Ailsa Craig Island, it is important to note that the Lighthouse Tower and the former Lighthouse Keepers Dwellings are excluded from the main sale. Also the Pier, Railway, Winch House and related land are not part of the main Ailsa Craig Island sale. We would be more than happy help any prospective buyer to make sure they ended up reuniting the whole lot if they were considering buying the main island. Ailsa Craig Island is formed from a volcanic plug from a long extinct volcano believed to be over 500 million years old. It is an archetypal island mountain; a symmetrical cone of primitive rock thrusting from the sea 10 miles west of the south Ayrshire coastline and a symbol great natural grandeur. It extends to about 2 miles in circumference and rises to an elevation of over 1100 feet above the sea. Ailsa Craig is known particularly for two main assets. Firstly, it is the breeding ground for one of the largest colonies of gannets in the world and secondly it contains a most important ‘blue hone’ granite quarry, known the world over as the source of granite for curling stones. The lighthouse (not included) was built in 1883-6 by Thomas Stevenson. There is a delightful small cottage at the foot of the cliff on the east side and a ruined castle approximately 60 metres up the path. Ailsa Craig island is for sale for the first time in many generations. Includes 2 Bedrooms Cottage. Price guide now £1,500,000 Freehold. Here at Unique Property Bulletin, we put Knight Frank in touch with the current owners of the separate lighthouse keepers dwellings which we used to own. You can just see these buildings in our photograph above. So it is possible to buy both the island, and the Lighthouse Complex (excluding the Tower), plus the Pier, Winch House and Railway. Guide: Offers over £1,500,000 (Island only – lighthouse buildings and pier by separate negotiation). Contact Mr Ran Morgan: 0131 222 9600. Was £2,750,000 – NOW £2,000,000. Our third candidate for a significant price shave is the wonderful Candacraig House, Highland Home of legendery Billy Connolly. The barber has neatly cut a handsome £750,000 off of the price. Original narrative from last year: The word “personage” is definitely a favourite of Billy Connolly. As is this building – Candacraig. Private home of the crème de la crème of comedy and this heart lifting gentle man. This is Billy Connolly’s Highland Home. Goodness knows how many wonderful evenings and joyous occasions were hosted here. It may be that the national treasure that is Billy Connolly has incredibly turned 70 Years of age that the sale of Candacraig has come about. Who knows. Given the quality time that Billy Connolly and his family have enjoyed at Candacraig, it must be a wrench to say good-bye to the old place. Onto the sale details of this splendid and unique building. 4 Reception Rooms; 12 Bedrooms; 11 Bathrooms. Walled Garden. Tempietto and Loch. Woodlands – About 14 Acres. Additional Four Cottages Available By Separate Negotiation. Candacraig House has a lovely setting overlooking its own grounds in the unspoilt highlands of west Aberdeenshire. The house is situated in scenic Strathdon with the River Don running through the valley in front. There are flat grass fields beyond and the house is backed by established forestry with moors and mountains rising above. Strathdon is surrounded by highland estates which offer a wide range of field sports, including red and roe deer stalking, walked up and driven grouse shooting, pheasant and rough shooting, salmon and trout fishing, all of which can be leased by arrangement. There is also winter ski-ing at the Lecht Ski Centre which is only 10 miles away. Balmoral, the highland retreat of the Royal Family, is only 16 miles away, just beyond Ballater. The house is close to Speyside and is within the Cairngorms National Park. The road through Strathdon joins the A939 which connects Ballater to Grantown-on-Spey. There are many deer forests and grouse moors in Speyside with salmon fishing on the famous Rivers Spey and Findhorn to the north. Inverness, ‘Capital of the Highlands’, is 65 miles away. Strathdon has a well established place on the Highland Games circuit, with the Lonach Gathering being one of the most famous games in Scotland. The Lonach Highlanders originate in Strathdon and their march through the glen in full highland garb is one of the most colourful occasions in the highland calendar. The present owners host the Highlanders at Candacraig House on the morning of the games. Although it has an idyllic rural setting, Candacraig House is not too remote. Aberdeen Airport is 45 miles away and offers daily services to London, other UK cities and Europe. Aberdeen also has a mainline railway station with direct services to London. Location: Candacraig House, Strathdon, Aberdeenshire, AB36 8XT. Guide: Was £2,750,000. Now £2,000,000. Contact Savills Agency Tel: 0131 247 3700 – Jamie Macnab or 01356 628628 Ruaraidh Ogilvie. Please can you help the Unique Property Bulletin stay free to use by letting the estate agent know that you found their property on the Unique Property Bulletin website. Tapadh leibh. Were £650,000 – NOW £485,000. Guide: Originally £650,000. Now Offers Over £485,000. Was £300,000; Then £250,000 – NOW £200,000. This appears to be an FTSAA – Failed To Sell At Auction. We believe it was originally scheduled for Clive Emson’s 26th July 2013 auction. However, this wonderful piece of solid stonemasonry didn’t sell. So we have a detached former chapel with plans in place and just needs a unique person with the vision and endeavour to create something Devine. Agency Description: NCT Estate Agents are delighted to announce that Richmond Wesleyan Chapel and School Hall is to be offered for sale. The chapel is a Grade II listed building, principally 2 storey in height and predominantly constructed of granite with granite quoins and dressing under a pitched slate roof. The property itself has gross internal dimensions of some 14.36 sq mtrs x 27 sq mtrs. Within the chapel itself is a raised section to the west comprising the organ and vestry. The principal entrance is to the church on the north and southern flanks of the east end elevation. The school building itself is single storey, believed to be constructed of stone and concrete block-work under hipped and transverse pitched roofs and under a slate covering. The hall has a gross internal floor area of about 367 sq mtrs comprising a central hall of 17.7 mtrs x 8 mtrs together with a number of ante-rooms and side rooms off. The hall is set at a higher level to the chapel and reached by external steps from the rear as well as having access to the side road. The chapel itself fronts Tolver Place and there is pedestrian access from the pavement to a large grassed area to the south. A pre-planning application enquiry has been made and the reference is: PA12/02271/PREAPP and this was for the conversion of the former chapel to residential use and demolition of adjacent hall and erection of 4 dwellings. A copy of this report is available on request. Location: The Old Chapel, Tolver Place, Penzance, Cornwall, TR18 2AD. Guide: £300,000 [July 2013]; Then £250,000 [Nov 2013] Now £200,000. Contact NCT Estate Agents Tel: 01736 331122. Please can readers help the Unique Property Bulletin stay free to use by letting the estate agent/owner/auctioneer know that you found their property on the Unique Property Bulletin website. Thankyou. Was £415,000 – NOW £380,000. We had originally listed the home/business at Glaisdale Railway Station in March 2012 at a guide of £415,000. We have now been advised that the price of this fine railway building has come down by £35,000. The new guide is at £380,000. There may be an opportunity for a Unique Property Bulletin reader to see how much more “flexibility” there may be in this delight for railway life enthusiasts. A wonderous railway home and business. Real Steam Visitor – The Sir Nigel Gresley (c) 2014 Mick Garratt. Well worth reading what a community can do with main gauge and narrow gauge railway lines, when the will to breathe life back into a community – indeed several linked communities – comes about. There is also a nearby narrow gauge railway with special treats for those with a love of steam engines. Tees Surveyors are delighted to present for sale this 1865 George Edmund Street designed property, originally used as the Station House to Glaisdale station. This property offers not only an idyllic place to live but also the opportunity to take advantage of the thriving established Seasonal Tea-Room business located on site. This property is located on the scenic Esk Valley line approximately 10 minutes form Whitby. The property itself has undergone refurbishment and modernisation over the past twenty years to bring it up to the contemporary standards with regards Central Heating and new Sash window installations. However the property still firmly maintains its traditional feel throughout with many preserved original features. To the rear of the property the land extends to approximately 1/3 of an acre and is laid out with a paved area and two modern Conservatory`s attached to the main building. The first Conservatory leads to Kitchen/ Dining area, this was used for the Tea-Room and can be accessed via the Station car park if you wished to utilise this business opportunity. The Second Conservatory leads into the Living Room and is perfect for enjoying the Magnificent Views of the grounds, which include; Three Garden Ponds, Lawn, Large Vegetable Garden, Double Greenhouse, Coal Bunker and Two Sheds (one with electricity!). This property briefly comprises; Entrance, 2 Reception rooms, 2 Conservatory`s, Library (Can be used as Further Reception, Office, or additional Bedroom) Extended Kitchen/ Diner, Landing, Two Bedrooms, Bathroom, Railway Line to Front, Large plot and Gardens to Rear. Rear Gardens; Large Plot, Large Patio area, Has been used for seating area for Tea-Rooms, 3 Ponds, Raised Flower Boarders with Variety of Trees and Shrubs, Vegetable Gardens. Location: Glaisdale Railway Station, Glaisdale, Whitby, North Yorkshire, YO21 2QL. Was £1,895,000 – NOW £1,795,000. A modest price reduction of £100,000. Perhaps a little more wriggle room in the eventual sale price. If this lights your candle, then certainly worth a trip across to Surrey for an inspection. Earlier Narrative: This impressive 5/6-bedroom house sits on a quiet no-through road in a beautiful lakeside setting, close to the town centre of Esher, Surrey. Designed by the renowned architect Royston Summers in 1975, the award-winning houses on Lakeside Drive are among the largest and most refined of Britain’s 20th-Century architect-designed houses. This particular property has the largest plot on Lakeside Drive and arguably the best lake views. This spacious and light-filled house (with a total floor area of over 4,000 sq ft over two floors) features five/six bedrooms, a spectacular living room, water frontage, gardens and a double garage. The interior is a careful combination of original features and recent additions. Original features include internal joinery of Canadian white rock maple. The exterior of the house is composed of rich Ockley brick. This property is one of the largest of sixteen Royston Summers-designed houses on the tranquil Lakeside Drive, a dedicated road with no through access. Previous to its current use, the land that forms Lakeside Drive constituted part of the gardens of Milbourne House (a former hunting lodge of Claremont House). The nine-acre site of Lakeside Drive has retained its original lake and collection of distinguished trees, many of which are subject to preservation orders. The houses won a RIBA award at the time of building and were described by the Architect’s Journal as having a “feeling of quality and privacy”. Esher town centre, which offers a wealth of shopping and dining opportunities, is within walking distance and central London (Waterloo) can be reached by rail from Esher station in approximately 20 minutes or Claygate station in approximately 30 minutes. Esher is a popular historic town in the heart of the borough of Elmbridge. Elmbridge has topped the annual Halifax ‘Quality of Life’ survey (judged on such things as health of residents, quality of schools, crime rates, employment rates and even weather) for the past three years. Esher is also blessed with some of Britain’s best architect-designed modern houses (including Patrick Gwynne’s ‘The Homewood’, 1937, now owned by the National Trust). Other local attractions include Sandown Park racecourse, Claremont House and Gardens and numerous golf courses. Claremont Landscape Garden is very close to Lakeside Drive, as is Esher Common, the latter being a wonderful public space suitable for walks. Location: 1 Lakeside, Esher, Surrey, KT10 9EZ. Guide: Was £1,895,000 [September 2013] – Now £1,795,000. Contact Modern House Agencies Tel: 020 7704 3504 or Modern House Contact. Please can you help Unique Property Bulletin stay free to use by letting the estate agent/owner/auctioneer know that you found their property on the Unique Property Bulletin website. Thankyou. This week’s offering:- An exceptional Victorian water tower that sits by the edge of the Royal Estate at Sandringham. This functional building, of the highest provenance, makes a surprisingly comfortable nest among the tree tops looking across the Sandringham estate. Accommodation is stacked on the lower floors in the former custodian’s dwelling. A separate steep cast iron spiral staircase leads to an open viewing terrace atop the water tank. Beds 1 Twin, 1 Double. Location: The Water Tower, Appleton, King’s Lynn, Norfolk, PE31 6BB.